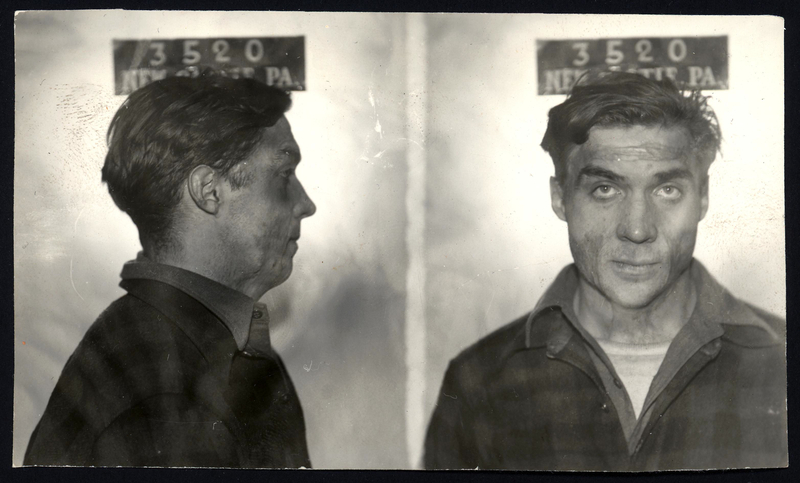 A year or two after the accident that burned the skin on his face that hadn’t been covered by a protective mask—the details of which are unknown—Victor Whipkey and his friends, Fay Marks and Joseph Pehak, ran low on gas as they passed through New Castle on a long road trip from their hometown of Mammoth, in Westmoreland county, to Ravenna, Ohio. They pulled into the E&W service station on Grant street and had the clerk fill up their Ford with eleven gallons of gasoline. Then, having no money, they drove off without paying for it. The clerk called the police, who stopped the car on the State street hill. A search uncovered a loaded .38 revolver in the glove compartment and several shells in the pockets of Marks’ coat. They arrested the three boys on a charge of being suspicious characters. In court, Marks claimed he had traded a hunter’s knife to Victor for the revolver. Victor said that he had been given the gun by Marks’ grandfather. The court had no interest in their explanations, and fined them all $10 for failing to pay for the gasoline, in default of which they were sentenced to sixty days in the county jail. Marks was given a further four months in jail for carrying a revolver without a licence. Victor enlisted in the army the following year, and was promoted to sergeant in September, 1943. He died in Davenport, Iowa, on 15 July, 1993, at the age of seventy-two. Sources: New Castle News (15 Jan 1941, “Three Youths Are Held By Police”; 17 Jan 1941, “Three Youths Admit Gasoline Charge”; 3 Feb 1941, “On Court House Hill”); Connellsville Daily Courier, 17 Sep 1943, “News Of Our Men And Women In Uniform”.